This is the perfect solution when a single USB 2.0 port does not offer sufficient power to an external hard drive. The USB Y cable features two USB-A male connectors and a single USB Mini-B male connector. 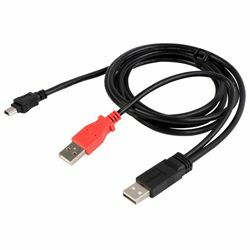 The 6 ft. cable can be connected to two ports on one PC to increase the power output to power the external device.